11 March, A resolution is passed at a student body meeting for the establishment of a student Wages Commission. David Hemson, Halton Cheadle, David Davis, Karel Tip and Charles Nupen together with political scientist Rick Turner lead the collective thinking on the establishment of the Commission. 8 June, The first meeting of the student Wages Commission is held at the Bolton hall at the University of Natal, Durban (UND). 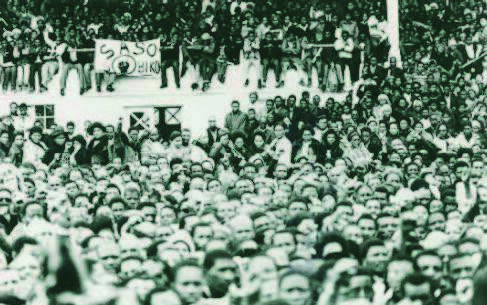 Beforehand, thousands of pamphlets announcing the meeting and explaining the Poverty Datum Line (PDL) were printed and distributed by the students to workers in industrial areas, outside factory gates and at taxi ranks. 400 workers attend, and all sign an objection to the Wage Board's latest ruling on the minimum wage, and demand a minimum wage of R20 per week. The petition is ignored by the government Wages Board which sets down a minimum of R 8, 50. 9 June, An unintended consequence of the first meeting of the Wages Commission is seen the following day, when a group of workers at the McWillaw Iron and Steel Foundry in Isipingo stop work. Waving the Wages Commission pamphlets, the workers quote R 16,50 as a minimum weekly income. The police were called in and an agreement with management is reached, with no pay increase. 25 June, At the first Wages Board meeting where students make a presentation, students lead evidence on the cement products industry. In the weeks before the meeting, students produce and distribute pamphlets outside factories, which explain the procedures of the Wage Board and the kind of evidence that will make a presentation effective. Workers are encouraged to draw up an inventory of their expenses to show that their current minimum wage is too low. More importantly workers are encouraged to attend the Board's meeting. July, A proposal is made at a National Union of South African Students (NUSAS) conference that wages and economic commissions, based on the UND model, be set up at Witwatersrand University (Wits), the University of Cape Town (UCT), Rhodes University (Rhodes) and the University of Natal, Pietermaritzburg (UNP). The proposal calls for a national effort to investigate the operation of the Wage Board, for students to present research to Board meetings and assist workers in presenting their demands. Whilst the motion is passed, the challenge to coordinate activities remains. September, 2000 stevedores threaten to strike if their wages are not raised. David Hemson, a student conducting research on the stevedores, begins to play a more active role as an advocate for the stevedores. Their demand is for a R14 wage increase, still below the PDL. The Wages Commission is instrumental in getting the attention of the White press, especially in terms of wages being below the poverty datum line. 23 October, An article appearing in the Daily News argues: " for those who lightly dismiss the students as 'immature cranks', the Commission's activities provide food for thought. They should not have to fight this battle alone". November, 2000 Ovambo contract labourers in Windhoek strike for higher wages. There is increased interest by the public and government on the question of Black wages. December, The Durban Wages Commission begins printing Isisebenzi (The Workers), a newspaper for workers. They also publish the Bulletin of the Wages Commission which reports on strikes, the work of the Commission, and labour disputes. At this time however, the morale of some students begins to wane. David Hemson becomes despondent about the lack of progress on the work of the Commission and considers withdrawing. January, The campus wages survey at UND had yet to be completed. The problem is with the questionnaires, which though completed, have to be redone. It is decided that Black fieldworkers conduct interviews and that money should be budgeted for this purpose. At this time Mike Murphy of the UNP is asked to take over the Wages Commission. Also at this time several studies are published on the 'minimum needs' debate. The South African Institute of Race Relations (SAIRR) as well as the University of Port Elizabeth published findings on the PDL as well as the Minimum Effective Level (MEL). March, Under the leadership of Murphy, the survey is completed. It finds that of the 59 unskilled African employees of the university, more than 70% earn wages below the PDL. Both the Durban and Pietermaritzburg Commissions recommend that the PDL be incorporated as the minimum wage level by January 1973. University authorities agreed to the recommendations only after students threaten to go to the press with their findings. April, UCT students at the Wage Board sitting for the Mineral waters manufacturing industry point out that the government policy as stated in parliament earlier that year, is to reduce the historical wage gap between White and Black. Arguing that the gap had actually widened, the students question the role of the Board in preventing the position of Black workers from deteriorating further. June, At a meeting of textile and furniture workers in Bolton Hall, Hemson tables the idea of starting a union, but this is not pursued. Harriet Bolton puts forward the idea of a fund to collect subscriptions from workers and to administer funeral benefits, which is enthusiastically accepted by the meeting. The General Factory Workers Benefit Fund (GFWBF) is launched in Durban and the first members sign up in October at the Benefit Fund's Pietermaritzburg office. July, Under pressure from the Commission, the university administration allows a University of Natal Employee Association to be formed. Black workers at UNP and UND hold their first meetings. The first leader of the Durban Committee is Fidelis Ngobese. Issues raised at the first meeting are the use of the words 'boy' and 'kaffir' by White staff members, and the different wages paid to workers of different race. 18 July - 19 July, Stevedores turn out in large numbers at the respective Wage Board sittings in Durban and Cape Town to argue their case for a minimum wage of R18, based on the PDL. Supported by evidence from the Commission, the workers are of the view that they have succeeded in obtaining their wage increases. The slow workings of the Wage Board are such that by October of that year, there is still no news on this. 9 January, Workers at the Coronation Brick & Tile factory in Durban down tools and demand first R20, and then R30 per week. This strike sparks off a chain of strikes throughout Durban which, by early February, see almost 30 000 workers on strike throughout Durban. Students of the Wages Commission are seen in some quarters, particularly by government, to have been 'agitators'. Subsequent interviews with workers play down the role of the Wages Commission in the 73 strikes, citing their 'disgusting' low wages as the main reason for the strikes. February, Rick Turner (UND Lecturer), Neville Curtis, Halton Cheadle, Paula Ensor, David Hemson and David Davis are all served with banning orders. There is a subsequent slump in both Wages Commission and union activities. • Davie, D.G. (nd). 'Making poverty research political: Student "Wages Commission" in 1971-1973', (unpublished thesis chapter).